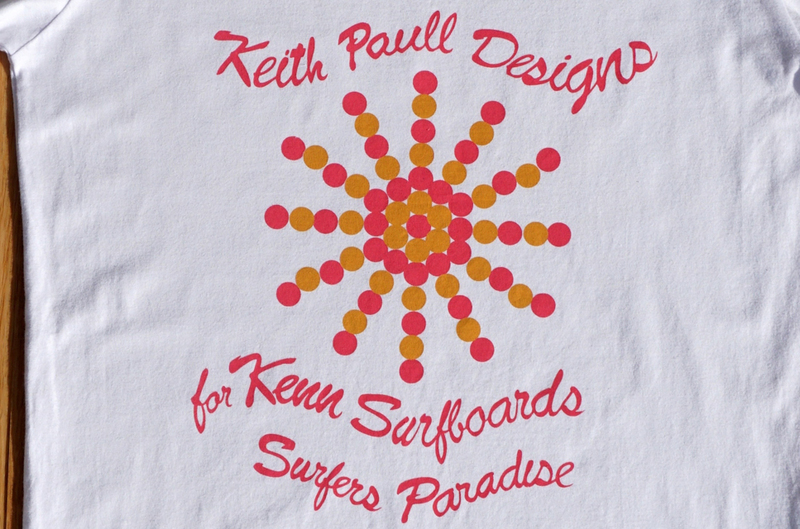 They’re produced in short runs only, and there are around 100 designs covering surfing’s 1950s, 60s, 70s and 80s. They’re all absolute genuine originals - and they pay a royalty to every shaper, board builder, photographer and filmmaker (and/or their families) they feature. Blond, muscular, tanned, handsome and hugely gifted, Keith Paull, could not have been a more acceptable face of Australian surfing as the sport negotiated the tumultuous late sixties. The hippie era was taking hold, hair was getting longer, surfboards were getting shorter, drugs were being consumed in large quantities. Paull resisted, at first. He became the only surfer other than the icons Nat Young and "Midget" Farrelly to win an Australian Open Men's title in the 1960s - with Young and Farrelly finishing second and third to the young Queenslander in an exhausting multi-round format in big surf on Sydney's Northern Beaches in 1968. The victory cemented Paull's reputation as one of Australia's outstanding surfers, which at the time opened doors in the US, which had become besotted with the shortboard revolution. Paull was also garnering a reputation as an excellent surfboard designer and shaper. He travelled to Europe and later to Hawaii, where he took on Oahu's big waves with great daring. He scored a lucrative contract to design and shape for Californian surfboard manufacturer Bing Copeland. Paull's friend and mentor, Hawaiian board shaper and contest impresario Randy Rarick, remembers the Australian as a conscientious career surfer and craftsman dedicated to healthy living. But at some stage in the early 1970s it all went wrong. Paull began to experiment with drugs, especially LSD, and by the middle of the decade his reputation was for outrageous behaviour rather than for good surfing. By the end of the decade he had vanished from the sport and the industry. Paull died in his sleep in a Brisbane hostel aged 57. Returning home to Australia in 1975 from extended travels to Indonesia and Hawaii, brothers Phil, Dave and Chris Byrne were all completely addicted to the sport of surfing. Dave had won the Bells Beach junior contest, Chris the Australian junior and world junior title, and Phil was shaping for local manufacturers in Australia and Hawaii. They set up their own label and the boards were soon world class and attracting many great surfers of the time to use them - Shaun Tompson, Larry Bertleman and Tom Carroll being just a few. They’ve been making beautiful boards ever since – short and long – and currently Byrne’s Department of Youth is perhaps the best junior team in the world, spearheaded by Owen Wright. 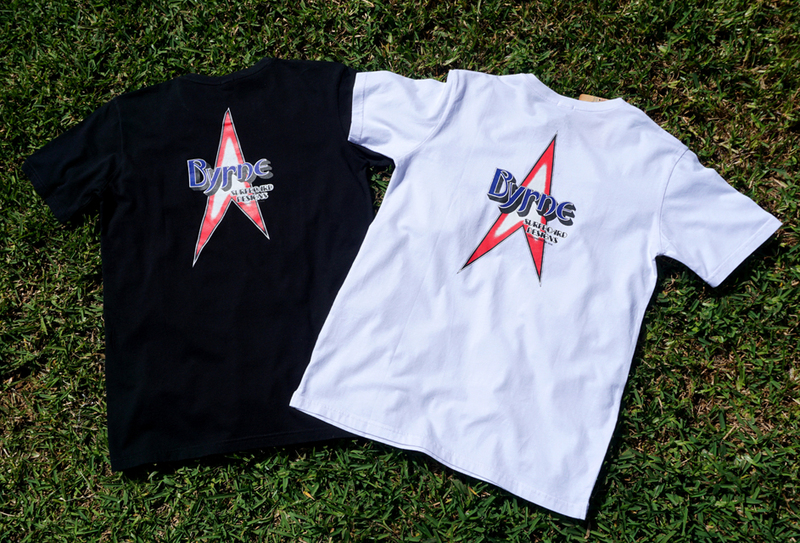 Featured is the classic spearhead Byrne logo. A much respected underground label associated originally with Alf Jeffries in Sydney and then Bill Cilia from the early 70s out of the factory at Kincumber on the NSW Central Coast. Originally known as Nevada Surfboards they ran ads in Surfing World in 1971 featuring Billy under the Nevada name. 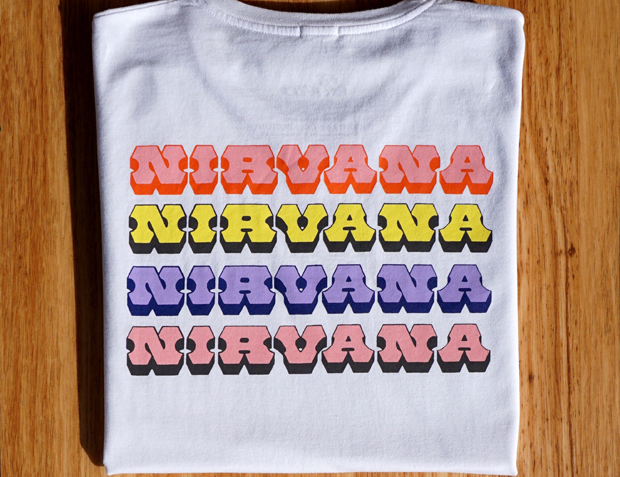 Presumably they changed it to Nirvana when they realised that a landlocked US state bore no relationship with surfing. They kept the same striking typeface for their logo though. 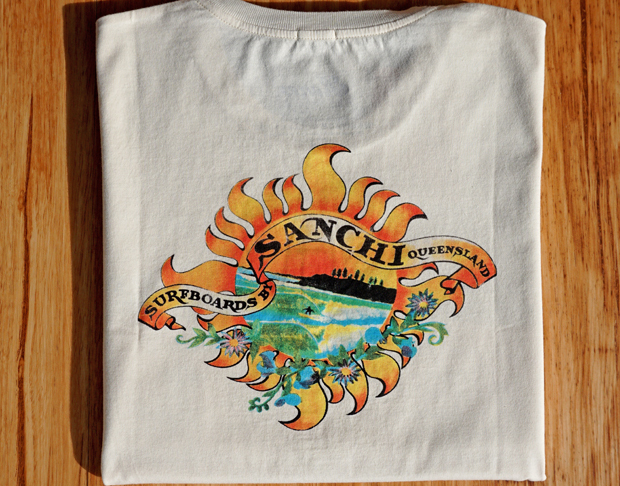 Despite a lot of feelers out there in the surf networks, we’ve haven’t been able to find out much at all about Snchi Surfboards, beyond that were out of Queensland and had an absolute killer piece of classic 70s art as their logo. We’d love to know more – if you can fill in any gaps please contact Rare Surf Tees.